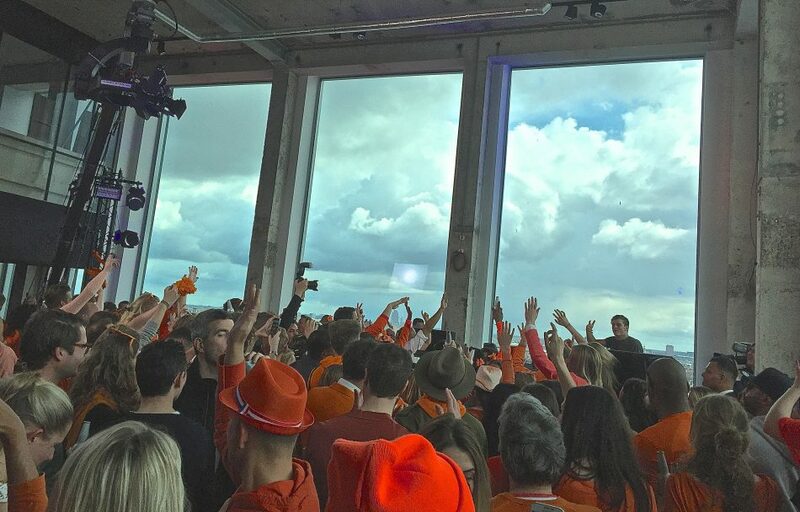 Holland celebrated their own King’s birthday (Willem-Alexander) for the 3rd year in a row in April 2016. 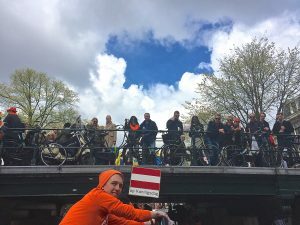 This fun event is known as “Koningsdag” or “King’s Day” and is held on April 27, a national holiday in the Kingdom of the Netherlands. 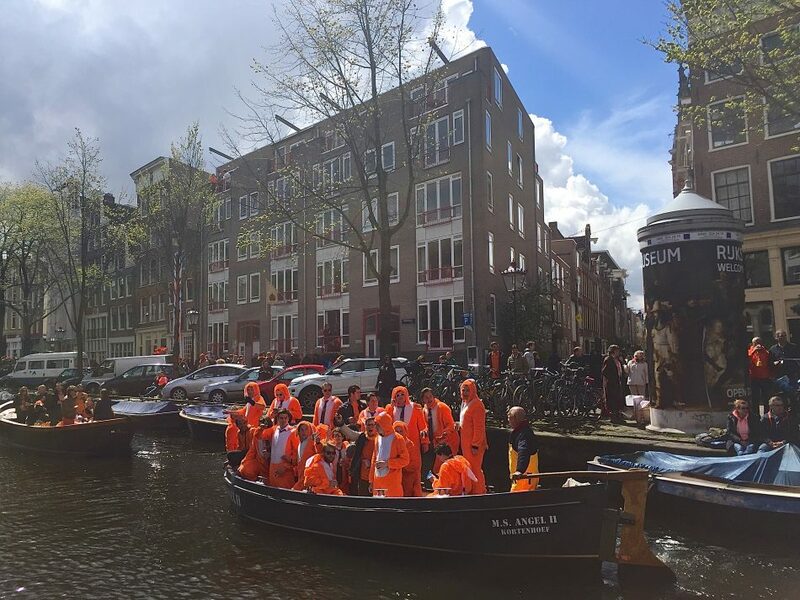 Two of the Netherland’s largest brands, KLM and Heineken, joined forces to celebrate this special occasion in variety of ways including bringing a lavishly decorated bright orange boat to the canals of Amsterdam. 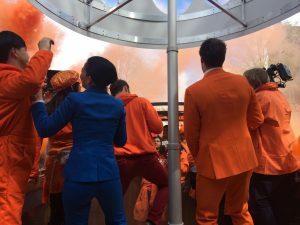 In addition, both companies creatively surprised four KLM customers from around the world, (these are individuals who share the same birthday as the Dutch Monarch), by gifting round-trip tickets to Amsterdam and providing accommodation during their stay here. The memories from this once in a lifetime opportunity will surely never be forgotten by these individuals. 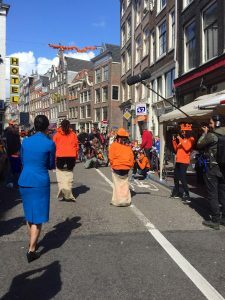 Although Koningsdag is relatively new (only 3 years young), this celebration originally began on August 31, 1885 as “Prinsessedag” or “Princess Day”, the 5th birthday of Princess Wilhelmina, heir to the Dutch throne. On her accession to Queen five years later in 1890, the holiday became “Koninginnedag” and the date changed to her birthday, August 31, 1891, which was celebrated for close to 60 years. The date of the holiday was changed when her daughter Juliana became Queen, on her birthday on April 30, 1949. 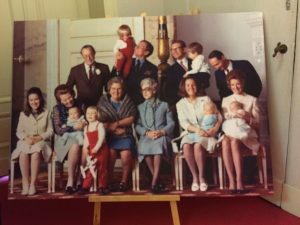 When Queen Juliana’s daughter Beatrix ascended the throne in 1980, she kept April 30 as Queen’s day (although her birthday was on January 31). 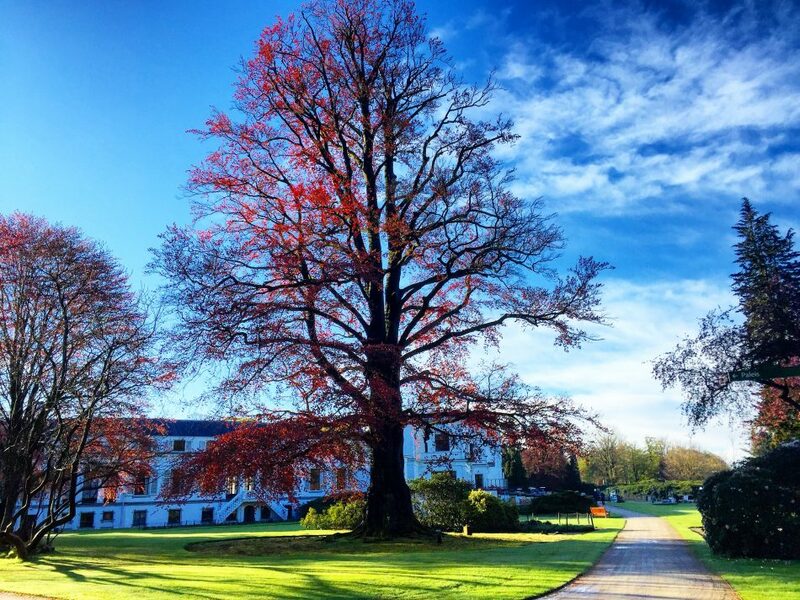 Tradition followed accordingly with the succession of each Dutch Royal offspring’s birthday. 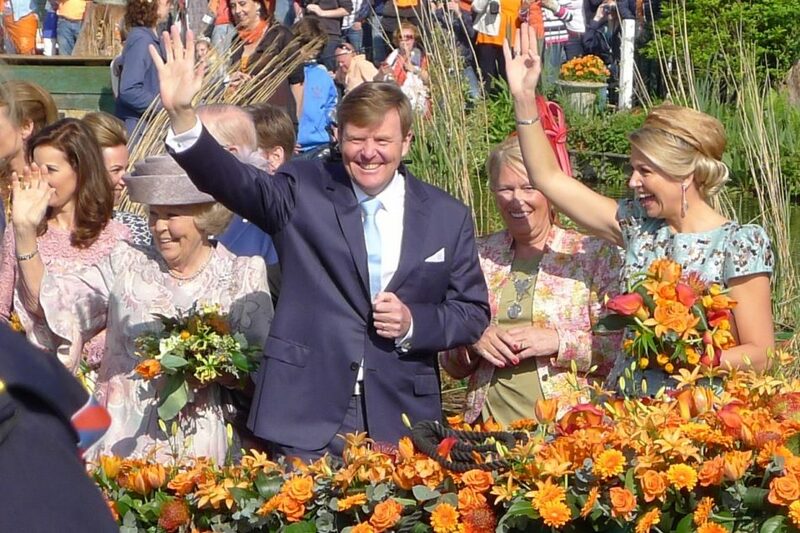 However, in 2013, Queen Beatrix abdicated and King Willem-Alexander succeeded his mother; the date was then changed to his actual birthday on April 27 – the first king since the observance of this national holiday, now “Koningsdag“! 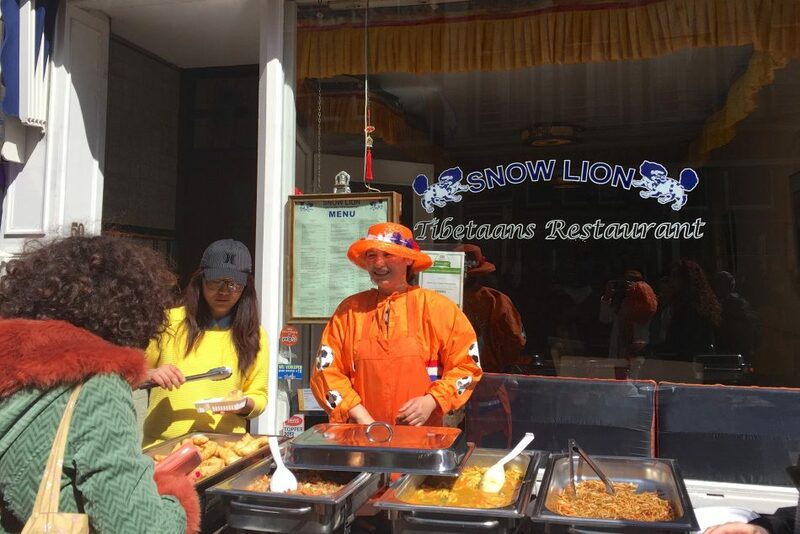 On each Koningsdag, King Willem-Alexander visits a different town in Holland. In 2014: De Rijp and Amstelveen. 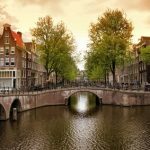 He has not visited Amsterdam yet. Most businesses are closed for this national holiday, but not restaurants, bars and various shops who earn some of their biggest sales of the year on this single day. Individuals and families gather on the streets and set up flea markets or ‘free markets’ as the locals call it, “vrijmarkt”, to sell clothing and used goods they no longer need. 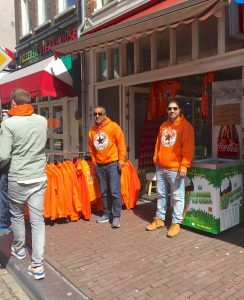 This is the one day that the Dutch government allows sales on streets without levying value added taxes. 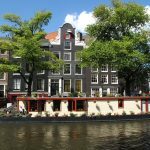 The most popular place to shop in Amsterdam is in the Jordaan quarter, but increasing in popularity is the Apollolaan in front of the Hilton hotel or Vondelpark in southern Amsterdam. 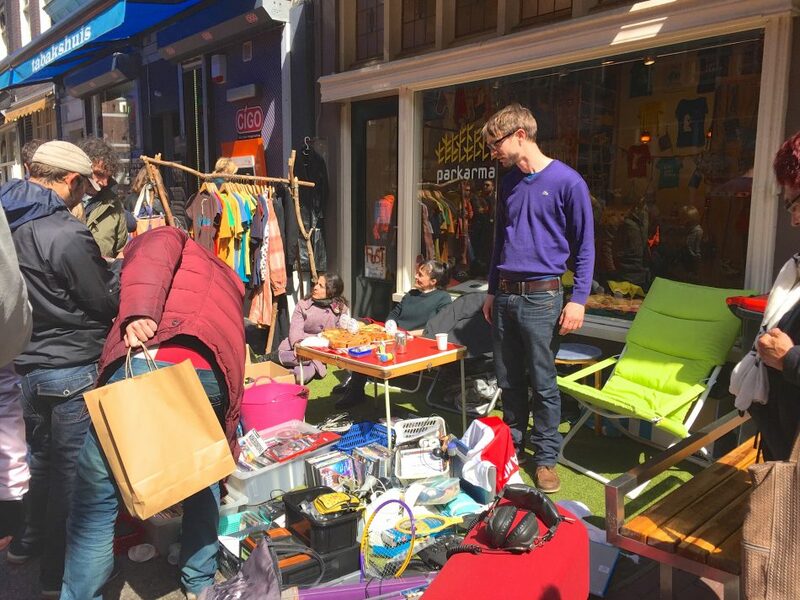 In Utrecht, you can find an overnight flea market. 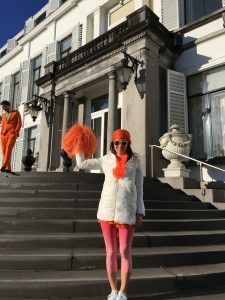 Most people wear orange colored clothing, (the king’s favorite color) but this color is also a representation of the House of Orange-Nassau which rules over the Netherlands. 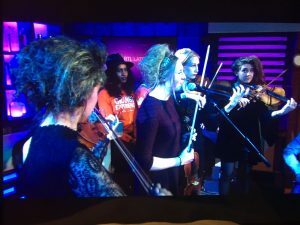 People are openly allowed to drink alcohol on the streets and celebrate, while concerts, performances, DJs & festivals can be found virtually around any corner. An outdoor concert is held on Amsterdam’s Museumplein, where as many as 800,000 people may gather. At night, access to bars and clubs are endless, especially in the well-known Red Light District. 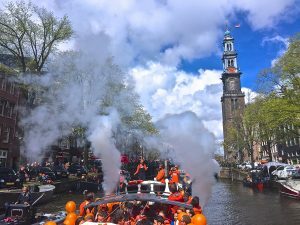 While the city of Amsterdam boasts approximately 750,000 residents – during this week’s festival, close to 1 million visitors arrive from around the world. As one would expect, the city is infused with additional energy. 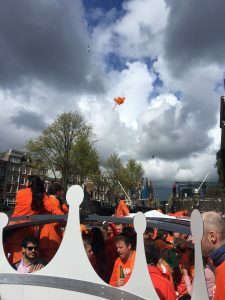 -One committee member said about Koninginnedag several years ago. 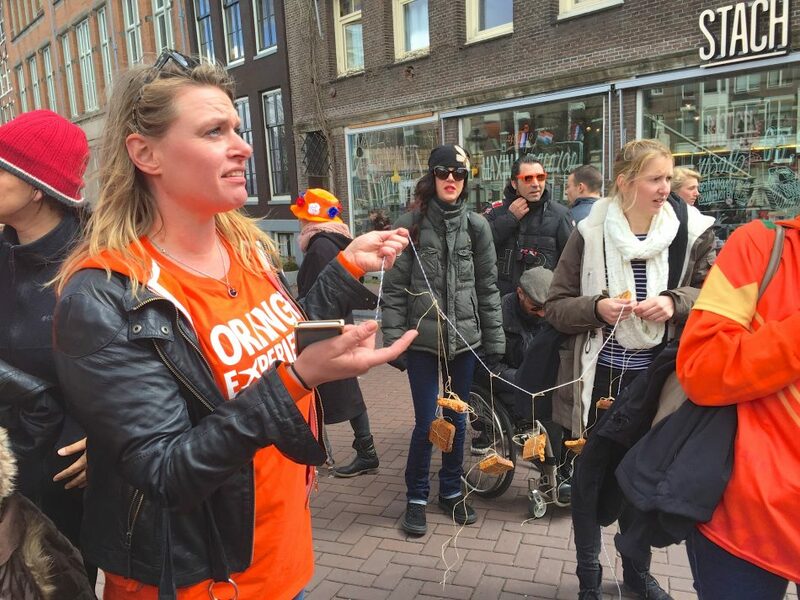 Children celebrate with a variety of games including ‘koekhappen’, in in which they attempt to catch spice cakes dangling from a string in their mouths, and ‘spijker poepen’ – a string is tied around their waist with a nail dangling at one end – they attempt to lower the nail into a glass bottle. Potato Sack races are also common – these are a favorite activity for International visitors. 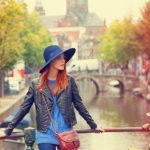 KLM posted a contest online months before the event; customers around the world had the opportunity to upload videos introducing their significant other or friend who’s birthday shares the same day as the King’s – April 27, and explain why they deserved to win the trip. Four very lucky guests were chosen from Beijing, Rio de Janeiro, London and San Francisco to celebrate. These individuals were surprised in their own home or at their job weeks before, by a KLM staff with a letter explaining this amazing trip. 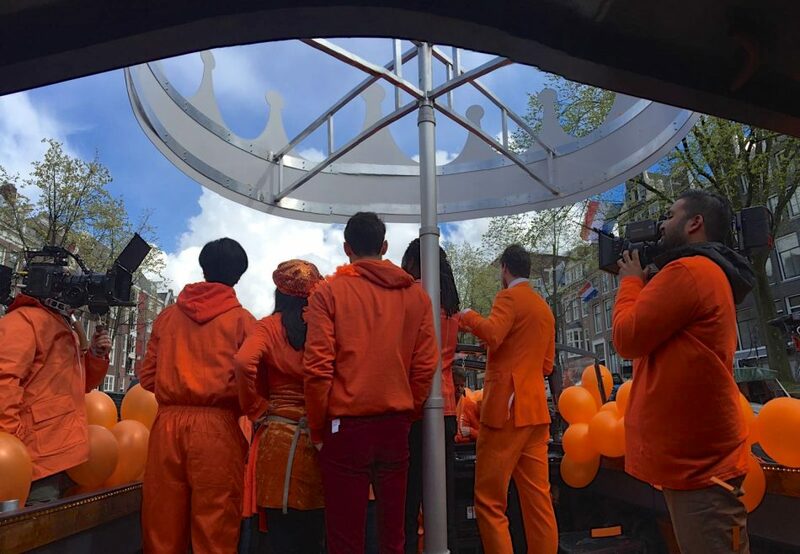 However, few details were revealed about their participation in King’s Day, so as you can imagine, their anticipation and excitement was strong. This was the first time abroad for the San Francisco couple. 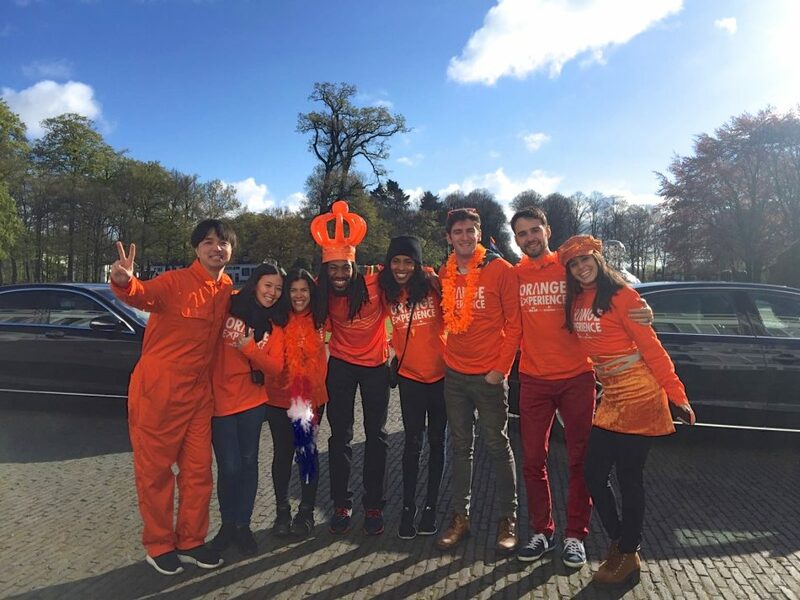 The “Orange Experience” celebrations began the morning of Koningsdag in the affluent, well-known city of Soest, (home of the former Dutch Family Palace). 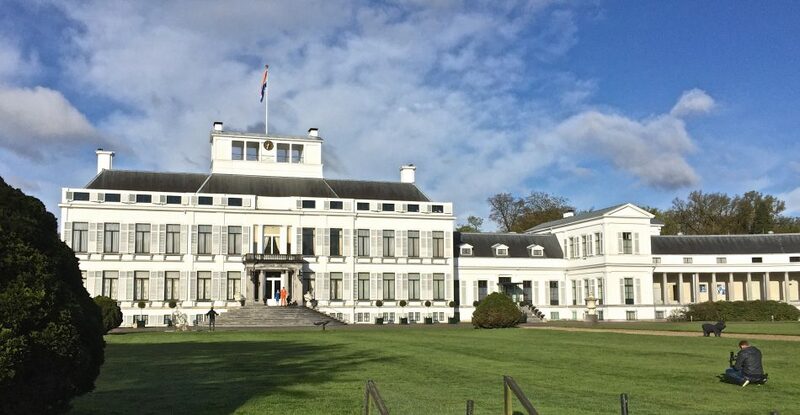 Queen Juliana & her husband Prince Bernhard lived in the palace for six decades. 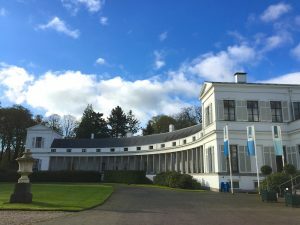 They both passed away in 2004 and the Soestdijk Palace has since become vacant. 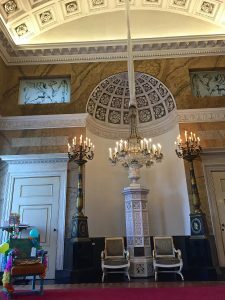 However the palace is still an important monument for the country of Holland. The weather forecast had shown signs of rain and showers all week long. 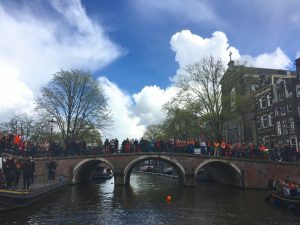 Miraculously on the morning of King’s day, the rain stopped, the clouds shifted away and the sun shone brightly to perfectly coincide with our arrival at the Queen’s palace. Once we arrived we toured the majesty’s home and the birthday individuals participated in a photo shoot (with out yet knowing why). 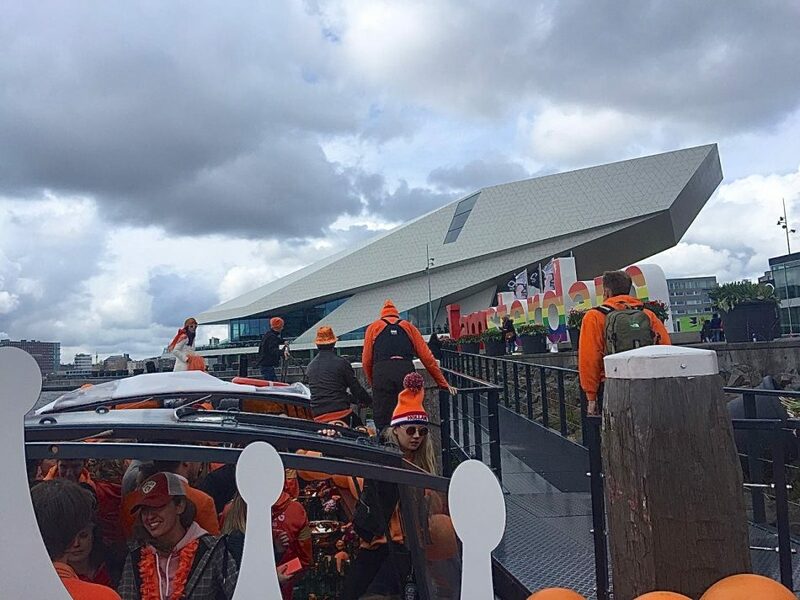 By noon, we headed to Amsterdam for a brief lunch, roamed the streets for an hour and then boarded Heineken’s “Orange Experience” boat for the main celebration. 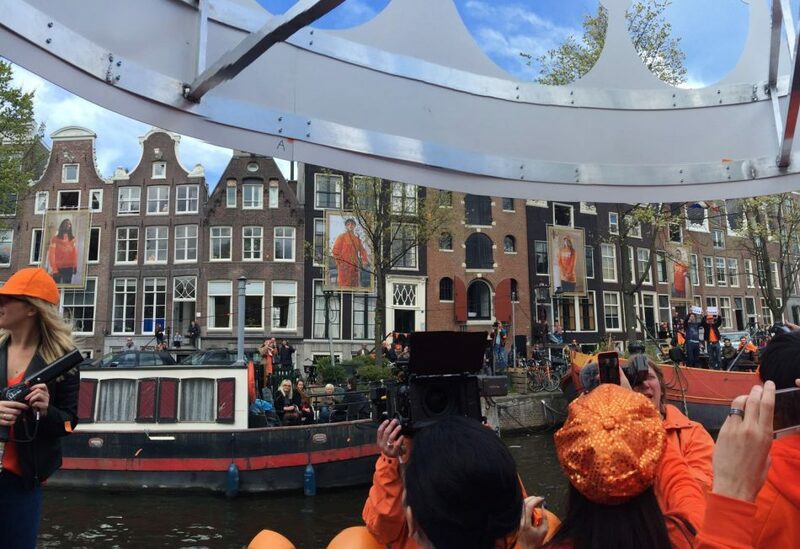 Here is a personal observation: the best DJ’s in the world come from the Netherlands, and it is no surprise that many private boats along the canals had their own DJ’s. 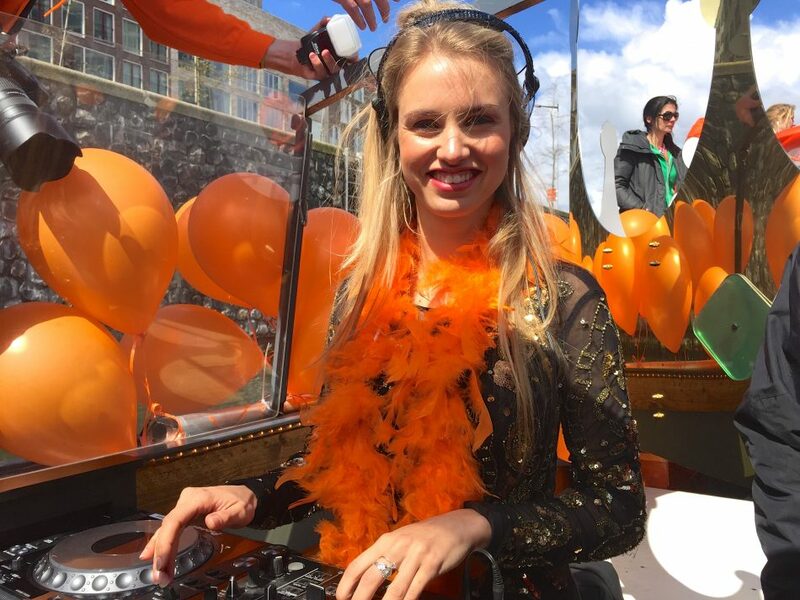 A gorgeous young lady played the turntables on our boat and we all enjoyed a seemingly unlimited supply of Heineken as we drifted along the canal. 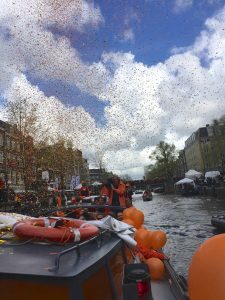 Heads turned as our Heineken boat passed by, with confetti and orange powder filling the air in our wake. 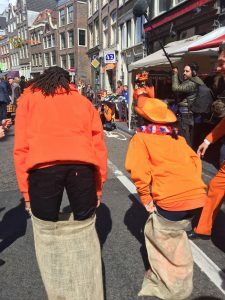 The streets were crowded with boys and girls, men and women, transgender, tourists, in all costumes, of all ages, shapes and sizes dressed in various shades of orange complete with a wild collection of orange accessories. What a ride! This resembles of St. Patty’s day in the US where the streets are filled with people in green. It was lovely to see a nation so strong, who are proud of their King and willing to come out in such large numbers and celebrate this special day. 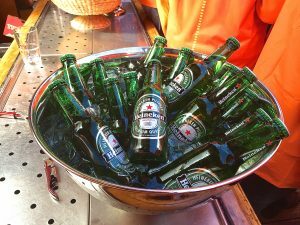 Near the end of our canal ride, our Heineken host pointed our boat in one direction. Soon, we would see large portraits of the four birthday guests hanging from the top of nearby buildings! Creativity and hospitality at it’s best! 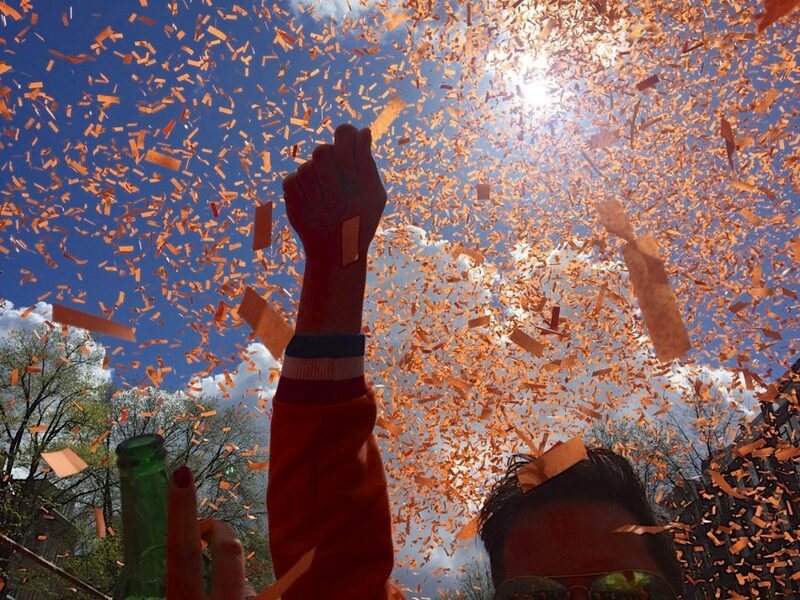 If you know nothing about Amsterdam, the one thing you will know is the party never stops. 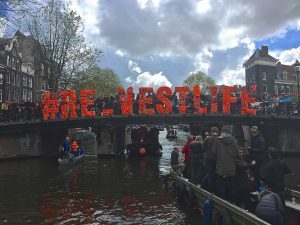 As we reached the end of the canal in the late afternoon next to the famous “I AMsterdam” sign, a helicopter circled above us, a foreshadowing that somebody important was about to grace us with their presence. Hmm.. who could it possibly be!? 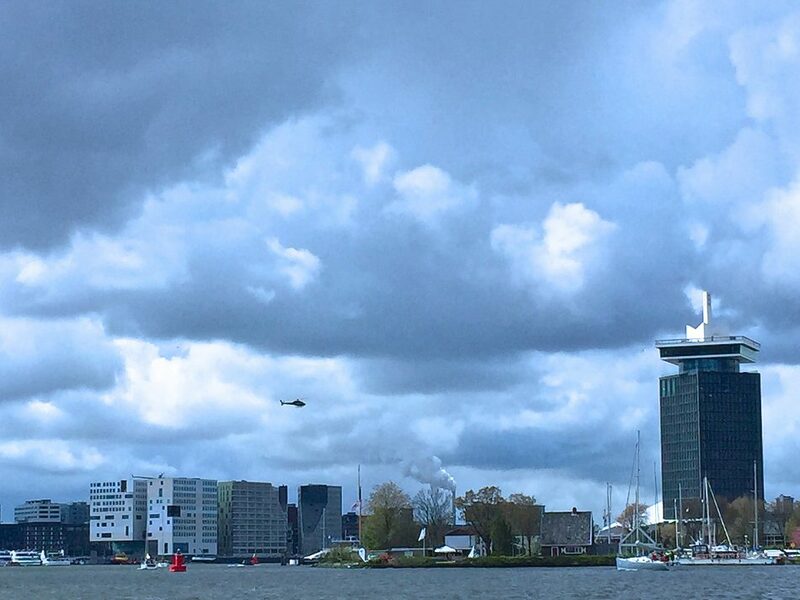 We anchored the boat and entered the A’DAM Tower (which stands for ‘Amsterdam Dance and Music’), a 22 story tower still under construction; very soon to be one of Amsterdam’s hippest buildings with bars, restaurants and music companies inside complete with a 360° view from the observation deck. 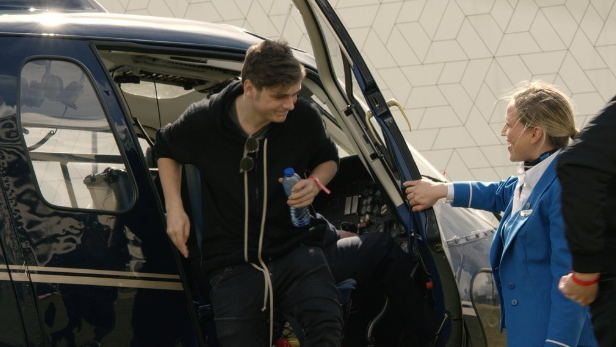 We rode the elevator up; when we exited the world famous Dutch DJ (he flew in on the helicopter we spotted earlier), Martin Garrix suddenly appeared and mixed his top beats for several dozen other people celebrating birthdays – invited by KLM to participate in the fun – dancing and jumping, all the while overlooking the free-spirited city of Amsterdam’s. 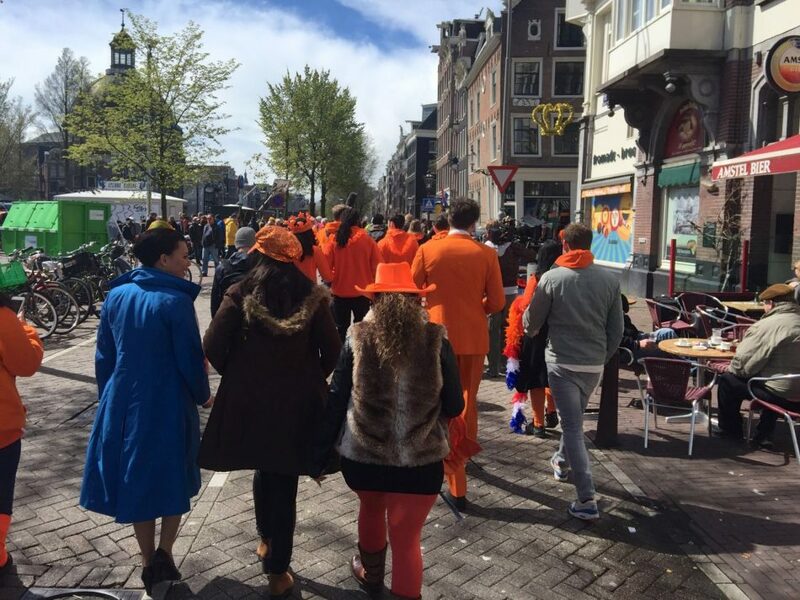 Koningsdag has become a celebration not only in the Netherlands, but also internationally. This cultural event is an excuse to party all day (for some, all week long). 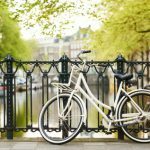 And for visitors, it is an especially good time to travel to Holland. 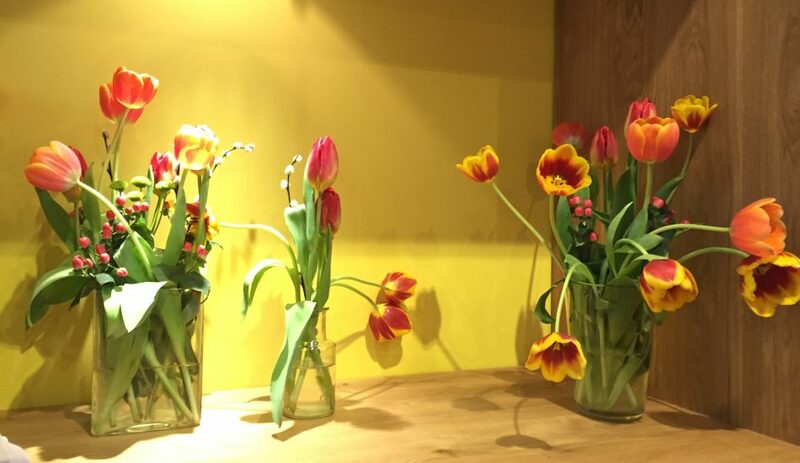 Tulip is the unofficial flower of Holland. KLM has direct flights from most major cities in the United States and around the world. They are ranked among the top three airlines in the world for best service and safety. 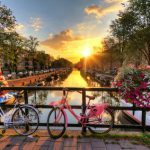 Stay near the Centraal Station, just 20 minutes train ride from Schiphol Airport, near all the action; you will be able easily join the party (by foot or bicycle). 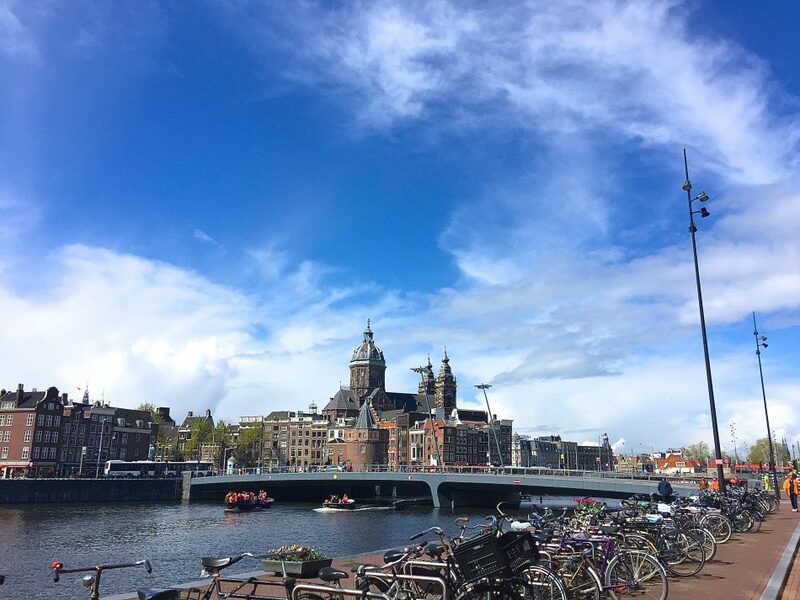 Doubletree Hilton is smart choice for accommodation as it is directly next to the Centraal Station, and is the home to the famous Sky Lounge, a rooftop lounge with an outdoor deck overlooking all of Amsterdam’s historic centre, bustling port and beyond. A view of Amsterdam from the Centraal Station. Photography credits: Author, KLM Royal Dutch Airlines, King Willem-Alexander – Wikipedia Commons. 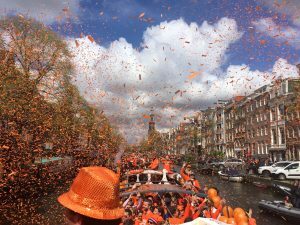 I was in Amsterdam in 2013 for the first King’s Day. What fun, seeing the street market (like a rummage sale) and everyone enjoying the day. Excellent article, Jacki. Thank you. 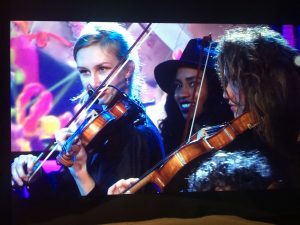 We also enjoyed all the photos and video. 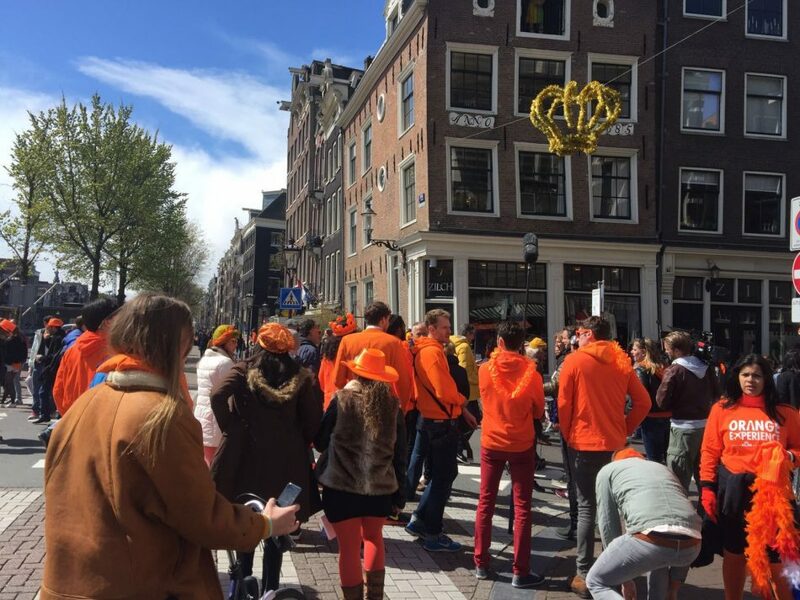 Celebrating King’s Day (Koningsdag) in Amsterdam, seems like a fun thing to do. Maybe, we can schedule the next celebration to be there in 2017 or 2018 as soon as we are back on the road and heading to Europe. Hup Holland! Sounds like a great time!